Week #1 & Week #6; Wednesday 4:00pm - Friday 6:30pm: Week #4; Sunday 4:00pm - Tuesday 6:30pm. Squeeze three excellent camp days into your busy summer! You’ll get a “heaping helping” of Resident camp-living and playing in the outdoors while building Christian friendships with counselors and cabin mates. You will lodge in a gender-separated cabin and spend each day with your co-ed family-unit of 10-12 campers and 2-4 counselors. You and your unit will plan your activities including swimming, group games, crafts, nature lessons, creek-play, parachute games, archery, climbing wall, orienteering, group challenge & initiatives course, GaGa Ball & 9-Square, Morning Watch, Bible study, special evening programs, night activities, skit night, daily group duties, hiking the camp trails, a polar bear swim, hosting meals, and nightly worship around the campfire. Amazing what we can fit into 3 days! #1 June 12-14 (Wed-Fri). #4 June 30-July 2 (Sun-Tue). #6 July 17-19 (Wed-Fri). Subsidized Fee (discounted cost) = $200; Supporters Fee (actual cost) = $250; Sustainers Fee (cost + $50 gift) = $300. The Supporters Fee is what it actually costs Camp Bethel to provide a summer camp experience for one camper, including counselor and lifeguard pay, utilities, insurance, meals, building and grounds maintenance, vehicle upkeep, replacing outdated equipment, accreditation and permits, program supplies and curriculum. Choosing the Sustainers Fee (actual cost + $50 gift) gives you the opportunity to help us do more with the mission funding we receive. You help us stretch our limited campership funds to help more children experience the power of camp. 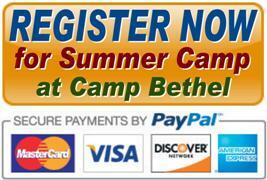 You help Camp Bethel make needed improvements and foster future growth in all we do. Through mission funding dollars, we are able to offer a Subsidized Fee. This reduced (subsidized) rate is made possible by our District congregations, our annual fund-raising events, and gifts from individuals who value the impact the summer camp experience at Camp Bethel has on children, youth, individuals and families.